As a paddler, this app has been a great addition to my kayaking ‘accessories’. WhereAmIAt? 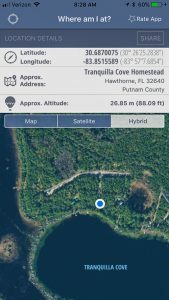 is the very first app I used on my kayak trips. The app is easy to use, it’s accurate and it does one thing and one thing well…let’s you know where you’re at! Made for the iphone, ipad and ipod touch, WhereAmIAt? is free… with ads. In contrast, the paid version is $3.99, however it does not offer anything extra except a very slightly larger screen without advertisements. Nevertheless I felt $3.99 was worth the cost of having an ad free app and I definitely use this app on every trip I take on the water or off. 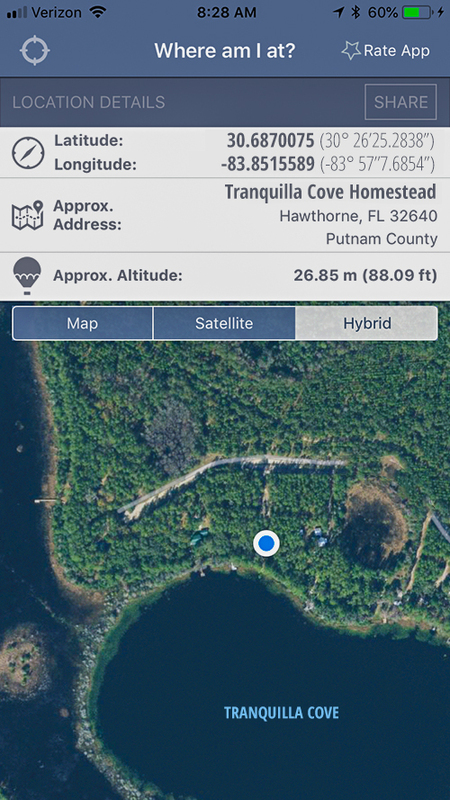 When the app is turned on, your location is displayed immediately on the screen with coordinates, address with county information and altitude. In addition to the easy to read display, the map has a zoom feature providing a closer look at your location when you need it. There are three options for viewing your map, Map View, Satellite View and Hybrid View. As you can see in the graphic to the right, the display is well laid out and easy to read. In my opinion, a key feature of WhereAmIAt? is the ability to copy and past location coordinates and addresses. Information is shared immediately on social media, email or through text messaging. As I come across unique point of interests on my paddles, whether it be landmarks, rest areas or changes in current, I quickly send that information to myself via email using it later in my final trip summaries. For free or for $3.99, in the final analysis, WhereAmIAt? is a great, useful app that I will definitely continue using on all my travels.